James C. Atkinson began life the descendant of an impoverished farming family in rural east-central Mississippi. While a high school senior, he enlisted in the U.S. Army Air Force and, like so many young men of his generation, left his home to fight for his country in WWII. 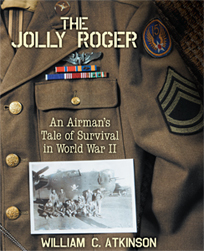 After a year of rigorous training, he was qualified as a Radio Operator/Gunner on a B-24 bomber, and what began as the adventure of a lifetime for Sgt. Atkinson, ended in horror and tragedy in the war-torn skies over Ploesti , Romania. Though this is Dr. Atkinson’s personal story, it is not unique. Rather, it is representative of the stories of legions of young men from the Greatest Generation who would face the challenge of rebuilding their lives after rising from the ashes of the most destructive war in history. William C. Atkinson is a Physician Assistant in Orthopedic Surgery, an instrument-rated private pilot, former off shore sailor and avid fl y fisherman. He is a student of WWII history and a WWII aviation enthusiast. He lives with his wife, Patty, in Lafayette, Louisiana.